A painting can be studied on several levels and from a variety of perspec­tives. 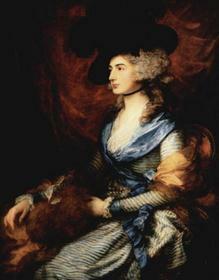 The "Mrs. Sarah Siddons” by Gainsborough has the distinction of being not only a remarkable work of art, but a unique interpretaion of a unique personality. It is not only one of the artist's finest portraits, but also one of the best of the many likenesses of the great tragic actress, who sat to most of the celebrated masters of her day- It was painted in 1783—1785, when the queen of the tragic drama was in her twenty-ninth year and at the zenith of her fame. An enthusiastic admirer who saw it in the Manchester exhibi­tion of 1857 wrote as follows: "The great tragic actress, who inter­preted the passions with such energy and such feeling, and who felt them so strongly herself, is better portrayed in this simple half-length in her day dress, than in allegorical portraits as the Tragic Muse or in character parts. This portrait is so original, so individu­al, as a poetic expression of character, as a deliberate selection of pose, as bold colour and free handling, that it is like the work of no other painter. Thomas Gainsborough (1727-88) was another English lad who neglected study for love of drawing and for love of the outdoor world, though he won greatest fame as a portrait painter. Always a dreamer and impulsive in his tendencies was Gainsborough; and his expression in line and color was spontaneous and free. Reynolds had moved with ease in a sphere of large experience in life. Gainsborough, more shy and retiring, had to be drawn into prominence. Although at fifteen he went to London to study, when three years afterward he began his career as an independent artist it was back in the retirement of his old haunts. He loved a quiet life in his own home, with his wife and his music and his dreams. He loved the familiar countryside of his boyhood, where meadows, trees and streams had sung to him and given him his first visions of beauty. There he lived and worked for fourteen or fifteen years before going to Bath, where he became popular as the portrait-painter of fashionable beauties and of royalty. When he painted his rare portraits of lovely women he set them in an atmosphere of naturalness, for he seems to have perceived within them the impulses and feelings that belonged to them as human beings. His own sensitiveness helped him to catch vibrations from their hidden selves. A gentle melancholy and a brooding tenderness breathe lightly through the delicate colors with which the artist made his record of the impressions that came to him from his sitters. His pictures of children - whether peasants or gentler-born-show them moving with natural freedom through the light and air of out-of-doors. Among the most valued of his portraits are that of Georgianna, Duchess of Devonshire (now in America) and that of the Honorable Mrs. Graham (in the National Gallery of Scotland in Edinburgh). For the most part his works are in private collections on both sides of the Atlantic. Read the description of the picture and try to enlarge it. "Portrait of Duchess de Beaufort". Thomas Gainsborough (1727-1788) was an outstanding English painter of the 18th century. He was a favourite portraitist of the aristocracy. The artist's deep psychological approach enabled him to impart a poetic expression of individuality. Gainsborough's "Portrait of Duchess de Beaufort" is an exquisite work of art. The artist depicts a graceful and attractive young woman. She has a pleasant oval face, straight eyebrows and black eyes, a straight nose and well-shaped delicate hands. You can see that she is an aristocrat. Her rather pale complexion is contrasted by the dark colour of the background (the dark background was traditional in Gainsborough's time). The artist enlivens the face by a little colour on her cheeks. 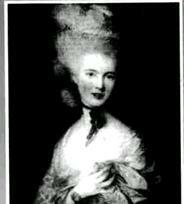 Her greyish hair is combed very high and fastened with a comb and a blue ribbon, as was the fashion in those days. The dress is very low cut, also according to the fashion of the day. The portrait is painted in cold colours (black, blue, grey, white). At first sight you may think that it is a traditional ceremonial portrait, but if you look attentively, you will see that her parted lips, fleeting glance, and graceful gesture of her hand help to create a true impression of the sitter's vitality and optimism. The woman in the picture is alive, and we have a feeling that she is looking at us.